If there’s a cornerstone in Downtown Fargo, Dempsey’s Public House is it. 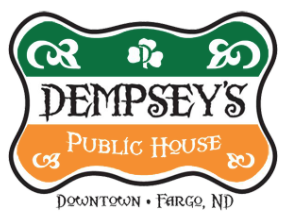 The Fargo-Moorhead areas original Irish pub, Dempsey’s features a friendly atmosphere with great food and live entertainment. Opened in 2006, Dempsey’s quickly became central to the renaissance of Downtown Fargo. The pub is located just steps away from the historic Fargo Theatre, and has become the meeting spot for everyone who lives and works downtown. Upstairs, The Aquarium is Fargo-Moorhead’s premiere live music venue which hosts touring independent and original artists in an intimate environment. Past shows have included nationally known artists including Band of Horses, The Melvins, Against Me!, Beach House, The War on Drugs, Macklemore, The Hold Steady, Aesop Rock and Father John Misty. The Meyers brothers, Bert & Klaus, invite you to join them and at Dempsey’s. Family is the most important thing to the Meyers, and they invite you to be a part of theirs. When they decided to open an Irish pub, they chose to honor their relative – the great Irish-American boxer Jack Dempsey. Dempsey held the boxing World Heavyweight Championship title from 1919 to 1926, and his tenacity and power made him one of the most popular boxers in history. In 2014 the brothers opened the Würst Bier Hall, a German-style Restaurant & Bar, at 630 1st Ave N in downtown Fargo.